This graph is from the Intergovernmental Panel on Climate Change (IPCC: http://www.ipcc.ch). 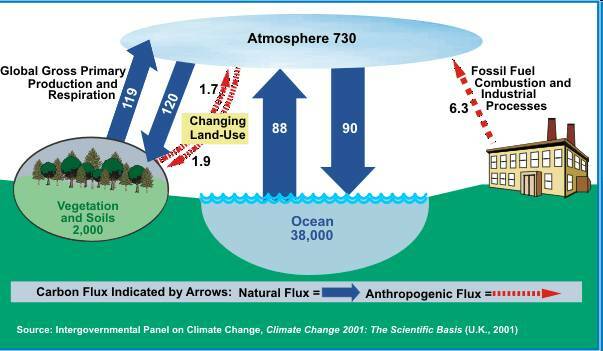 Although it portrays a simplified carbon cycle is does illustrate, and quantify, the movement (or flux) of carbon between the atmosphere, biosphere, and ocean on an annual basis. Additionally, it highlights, with red arrows, changes in the carbon cycle due to human activity. Therefore, it creates a nice balance between “natural fluxes” and “anthropogenic fluxes”. What should be pointed out from this graphic is that although the natural fluxes actually remove more carbon from the atmosphere on an annual basis via the processes of photosynthesis and diffusion, the Earth’s climate is near equilibrium. What is clear from this graph is the addition of carbon to the atmosphere from the combustion of fossil fuels. 1.How is carbon absorbed into trees and the oceans? What is the fate of the carbon in these reservoirs – how is it used and in what form? 2.How and why is carbon released by humans. 3.What are fossil fuels? How are they created and is this a short-term or long-term process? This graph shows recent trends in atmospheric carbon dioxide starting in 1958. These data are gathered from air samples taken at the Mauna Loa Observatory, Hawaii near the summit of Mauna Loa. The x-axis shows time in years and the y-axis shows carbon dioxide concentration as ppmv which stands for, parts per million volts. This unit is derived from the process in which the CO2 is measured. Air samples are collected in small vials referred to as cells which are placed into an analyzer. The analyzer passes infrared light through the cell. Carbon dioxide has the ability to absorb infrared light so the more carbon dioxide in the sample less infrared light will pass through. On the far side of the cell is a detector which is able to measure the amount of light passing through and this quantity of light is measured in volts. Using a series of standards the measured volts can be translated into the amount of carbon dioxide present in the sample. (Put another way: volts and carbon dioxide concentration are inversely related.). 1. The overall large positive trend of atmospheric carbon dioxide concentration over the last few decades. 2.Annual variation (cycle) in carbon dioxide concentration. This is a good place to have students hypothesize about the mechanisms behind the annual cycle. 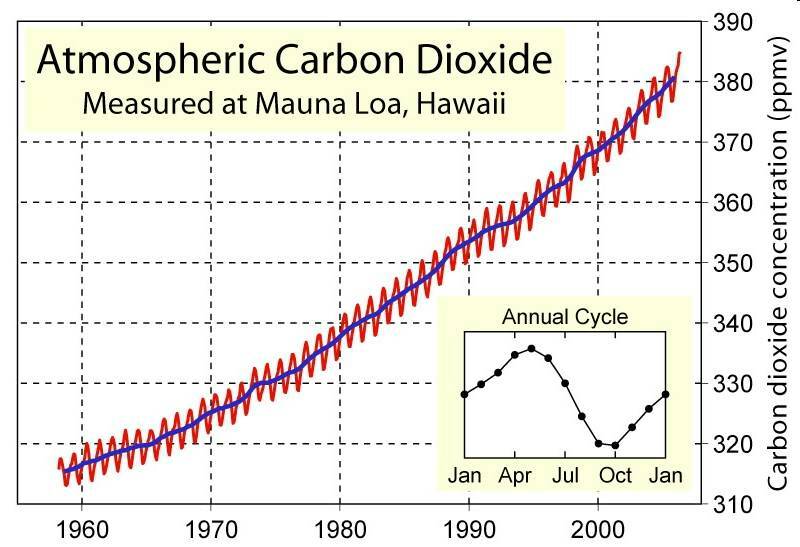 If they examine the small inset graph they will notice a decrease in carbon dioxide concentration during the months of approximately April through September. This is the uptake of carbon dioxide as plants begin photosynthesizing during the warmer months. The subsequent increase (i.e. October through March) is due to respiration especially from soils. This annual dynamic can provide a nice opportunity to review with students the processes of photosynthesis and respiration including the respiration of microorganisms in the soils. What is the difference between temperature and climate during the crest and trough in the annual cycle? Why are these data collected at Mauna Loa? Do you accept these data as scientific? Why or why not? Have students brainstorm multiple reasons CO2 is fluctuating during the annual cycle. Have students brainstorm multiple reasons for the overall increase in CO2 concentration. Have students hypothesize reasons for observing at Mauna Loa. Teacher could have students hypothesize other places in the world that would be good for recording atmospheric data and then research to verify. These data and graphs are from Raupach et al. (2007) in the journal, Proceedings of the National Academy of Science. The researchers were investigating the question, how do actual carbon dioxide emissions compare to modeled projections? Both graphs show multiple model predictions for increases in carbon dioxide emissions as gigatons of carbon per year. The bottom graph differs from the top graph mainly with respect to time and focuses in on a twenty year period from 1990 to 2010. 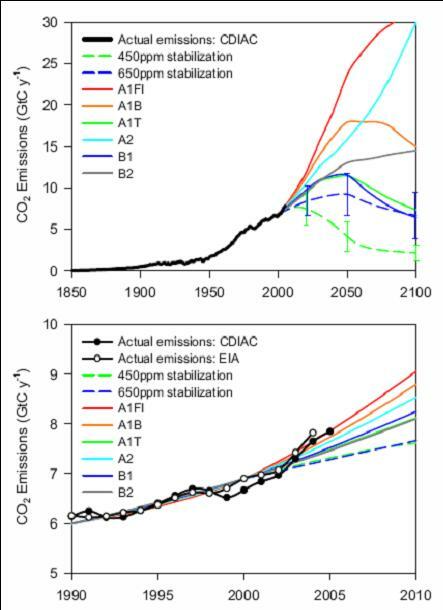 The colored lines on the graph show multiple carbon dioxide emissions scenarios including what happens if global economies were to stabilize at certain emission rates. The black lines represent what is actually occurring – that is the actual rate of carbon dioxide emissions. The big take-home message from these data is that current rate of carbon dioxide emissions is higher than even the highest modeled projection. 1.Have students research the different emissions scenarios (http://www.ipcc-data.org/ddc_co2.html). Have students discuss how scenarios were estimated, their key assumptions and any other unique features. 2.Have students research the differences between the CDIAC and EIA actual emission measurements. How are the techniques different and could this explain why they produce slightly different measurement. 3.It should also be pointed out to students that even stabilization will continue to increase global carbon emissions. After pointing out this trend to students, students should work in small groups and brainstorm solutions to this problem***. How could countries, economies, and communities work at small and large scales to create carbon reservoirs to pull carbon from the atmosphere? This exercise would be an opportunity for students to think both critically and creatively using their knowledge of biological and environmental processes. 4.Have students brainstorm or make concept maps about the differing perspectives of climate change and how different worldviews can influence our actions, policies, and solutions. These two graphs continue to show the changes in atmospheric carbon dioxide as well as its sources. The graph on the left comes from Oak Ridge National Laboratories and shows two patterns of atmospheric carbon dioxide. On the left y-axis is total atmospheric carbon dioxide in units ppmv (parts per million volts: see Mauna Loa carbon dioxide post for discussion of units). On the right y-axis is the contribution of anthropogenic emissions in units million metric tons). It should be pointed out clearly to the students that the scale of the two y-axes are different; however, the trends of the lines are what should be presented to the students as the take home message. The graph on the right shows another ways to present data – especially when it comes to relative amounts or percent contribution. These data come from the Energy Information Administration. (Please see date of publication and students should be made aware that these data are potentially out-dated). The story from this graph should be clear to students and the carbon dioxide from fossil fuel combustion in the largest contributor of greenhouse gases from the United States. 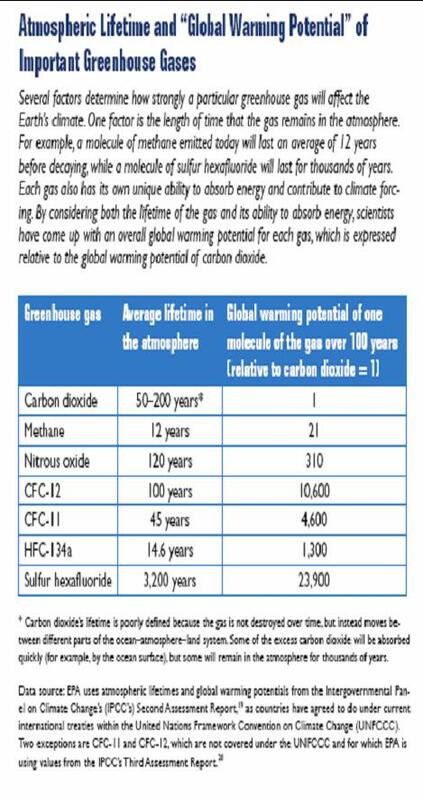 However, not all greenhouse gases are created equal. For further discussion of this topic please see post for Greenhouse Gas Potential and Forcing. 1. These two graphs show different ways of presenting data. What are some of the advantages of each approach? Is one more dramatic than the other? When would you use the line graph and when might you use the pie-graph and can these graphs be manipulated to make certain points? 2. Students can begin to research their own carbon footprints using the following links. When done, teachers could facilitate a class discussion on the differences between the calculators and the results. Teacher can then refer students to the following links to provide solutions in reducing carbon footprints. Although many agree that the climate is warming – the evidence has become too overwhelming – there remains debate over the role of humans. 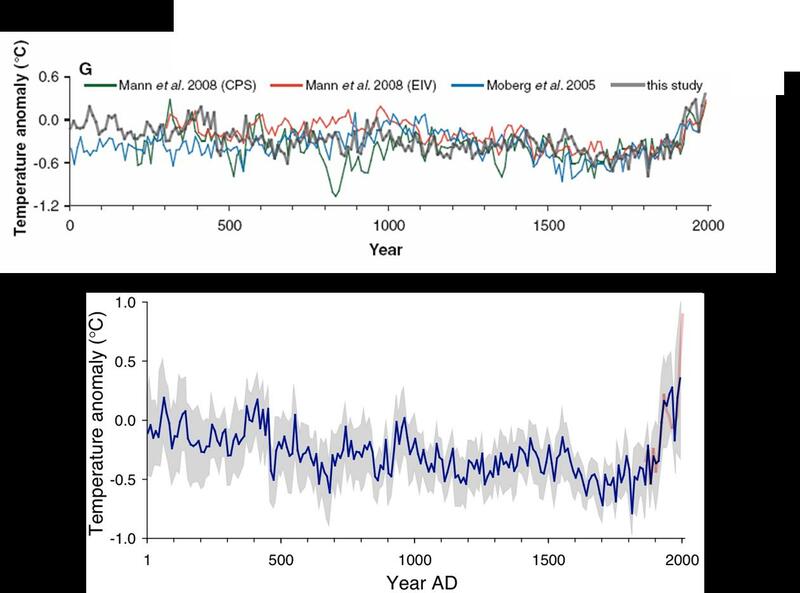 The strong carbon dioxide patterns that seem to line-up with the industrial revolution of course does not demonstrate a true cause-and-effect relationship. (Good point to discuss with students and remind them that correlation doesn’t mean causation.). Nonetheless, there does exist some very strong evidence that fossil fuel combustion is contributing to global warming and global climate change. This graph comes form Ghosh and Brand (2003) and was published in the journal, International Journal of Mass Spectroscopy. What is important for the students to understand is that the ratio of 13C/12C is different between the atmosphere and plants. Specifically, the ratio of 13C/12C is lower in plants than the atmosphere. If rising CO2 is coming from a plant-source such as fossil fuels than the atmospheric ratio of 13C/12C should be declining. This is indeed what is occurring . The above graph needs to be read carefully as the y-axis has been flipped from the traditional way student’s are accustomed. Notice that it is more negative as you move up the y-axis although the point is still the same. Over time (x-axis) the amount of 13C in the atmosphere is declining. Although forest fires for example would contribute to this isotopic change, the combustion of fossil fuels undoubtedly contribute and they do at a significantly greater level. (Have students review Carbon From Anthropogenic Sources) It would also be worthwhile to note that many contemporary forest fires are also the result for a warmer-drier climate and human activity. 1.Ask students how the trend in Forest Fires (e.g. throughout the American West) would contribute to this graph? 2.Consider a potential guest speaker (e.g. USFS official) to discuss forest fires, forest management, and climate change.